Craigieburn Animal Hospital is a leader of veterinary care in the northern suburbs providing high quality, best practice, team based care to small animals and greyhounds. The hospital is responsive to meet the needs of pet owners and breeders in the local region. Our services and facilities are designed to assist in routine preventative health care, early detection and treatment of illnesses, provision of emergency care and all aspects of breeding. Our highly qualified staff understand the special role pets play in families and are dedicated to becoming partners in the health care needs of your animals. You will be provided with sound advice and support from experienced veterinary professionals. 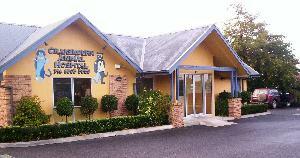 Your visit to the Craigieburn Animal Hospital will be as stress free as possible. Off street parking is provided. We understand cats and dogs have special needs when visiting or staying at the hospital. Therefore we offer a separate cat waiting and consulting area with a seperate cat-only hospital ward. Dogs also have a designated waiting room and hospital wards, with a third waiting area dedicated especially for greyhounds. Pet Insurance We are happy to assist you with your claims for pet insurance, please ensure you bring the required paperwork with you to the appointment for the vet to complete during your visit.